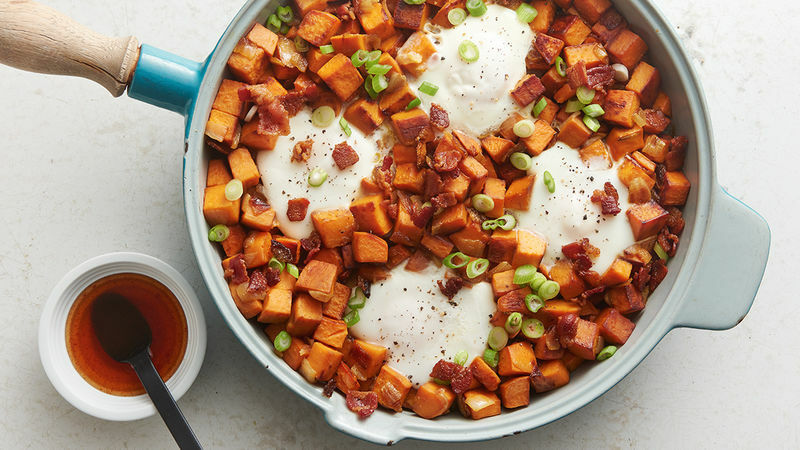 In 12-inch nonstick skillet, cook bacon over medium heat 10 to 12 minutes or until crisp. Using slotted spoon, transfer bacon to small bowl. Add sweet potatoes, onions, salt and pepper to drippings in skillet. Cook over medium heat 18 to 22 minutes, stirring occasionally, until potatoes are just tender. Increase heat to medium-high. Cook 4 to 5 minutes longer, stirring frequently, until potatoes are browned and tender. Stir; make 1 indention in mixture with spatula; crack 1 egg in indention. Repeat 3 times, spacing around pan. Drizzle eggs with vinegar. Reduce heat to low. Cover and cook 4 to 6 minutes or until egg yolks are firm, not runny. Top with bacon and green onions. In small bowl, mix maple syrup and hot sauce; serve with hash. Sometimes the quality of your bacon isn’t super important, but for this recipe, bacon is the star. For best results, opt for the highest quality bacon you can find. Drizzling a little liquid over the eggs helps the tops of the eggs steam and set up quickly so that the bottoms don’t burn by the time the tops cook through.